Calling all adrenaline-junkies! The Viper Challenge is here. What you may ask is the Viper Challenge? Well, you will be relieved to know that no snakes are involved in this contest consisting of an obstacle-filled test that extends over 20 Km. This inaugural event is due to be held over the weekend of 17th and 18th August at Kuala Lumpur’s Sepang International Circuit, famously associated with the Malaysia Formula 1 Grand Prix. The Viper challenge is Asia’s largest obstacle- based running event, designed to jolt you out of your comfort zone as it tests your limits with its many man-mad obstacles. The obstacles that litter the course have been imported from Australia and feature challenges like incline walls, pyramid trees, balance beams, jump platforms and many more. 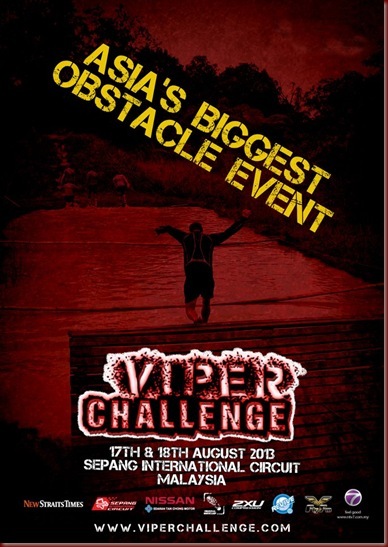 Participants of the Viper Challenge thus will be expected to crawl through barbed wire columns, dusty trenches, and corrugated columns and catapult over water and icy pools as they navigate these various obstacles of the challenge. The Viper Challenge is definitely not for the faint of mind, body or spirit. In fact organizers advice participants to undertake a ‘bootcamp training program’ at least three months before participating in this challenge, for the exacting challenge not only challenges a person’s endurance it also calls for much mental strength and discipline. You can sign up to participate in the Viper Challenge as an individual competitor or a team competitor. You can also either form or join a team. Registration for Asia’s longest, most challenging obstacle contest is only through the event’s official website. The registration fee that you pay gets you an original Viper Challenge t-shirt, miscellaneous Viper Challenge official merchandise items and a pass for the post event party. To participate in the inaugural Viper Challenge, you have to be at least 16 years of age. However, if you are under 18, you have to have your parent or guardian sign a consent form permitting you to participate in the challenge. You will be asked to show some form of I.D. like a government issued I.D. card or a passport before you are allowed to compete in the event. This requirement is non-negotiable and without I.D. you will not be able to compete in the challenge. Before you can participate in Viper Challenge, you are expected to sign a form that you are taking part in the event at your own risk and have understood that there may be a probability of personal injury. This disclaimer form is also a necessity. Once you have paid your fees you will not be issued a refund for any reason. Even in the case of injury, before the event you will not be issued a refund as the organizers have no way of assessing the gravity of your injury. The Viper Challenge is not a race but a test of endurance, strength and mental toughness. A participant’s personal best is not as important as the successful completion of the race. 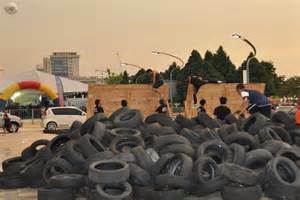 Participants are encouraged to attempt every obstacle and not miss out on any one. Most participants are expected to complete the challenge within 3 to 4 hours. If however, a participant or team has not reached the half-way mark at a designated time, the organizers will supply the participant/team with a modified course in order to ensure they complete the course by nightfall. The start time of the challenge is decided by the organizers on the basis of a wave concept i.e. competitors will be allowed to start the challenge in batches of 500 participants, every thirty minutes. Once you have been informed of your start time, you will not be allowed to change it. The challenge will require participants to run, crawl, swim and more as they traverse the obstacles of the course. Dri-fit sporting attire is recommended as are sturdy, closed running shoes. Participants are also advised to leave personal devices like smart-phones, tablets and mp3 players locked in the lockers provided for the participants on site. Water, energizing and first aid stations will be dotted around the course. The event site will also be equipped with toilet facilities for the participants. The Sepang International Circuit is easily accessible by rail, road and air. The Kuala Lumpur International Airport (KLIA) is located only ten minutes away from the circuit and various car rental companies have a presence at the airport. If however, you are coming from KL you can either use commuter or express trains, airport coach services or taxi or limousine services to get to the event site. More many hotels are located within the Sepang area and offer various choices for accommodation. The event will go on come rain or shine. In fact torrential downpours will heighten the ‘fun’ aspect of the event. 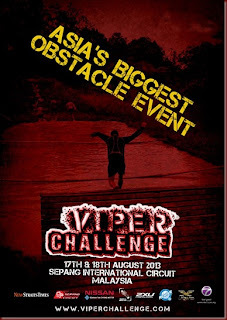 So if you think, you have got what it takes, why not enter the Viper Challenge to test your mettle?